The Royal Crown was built in the Netherlands in 1996 and originally launched as the River Cloud. After a full refurbishment in 2009, she returned to the waters under the name Royal Crown, looking better than ever. Built in the style of a glamorous, 1930s yacht, the 360-ft (110-metre) Royal Crown carries just 90 passengers (and 30 crew), making it one of the smallest river cruise ships in Europe. Teak decks, arched picture windows and art deco-style rosewood and mahogany furniture give the ship an extremely elegant, classic feel –- prepare to have your photograph taken multiple times when sailing aboard her, as she really turns heads. Royal Crown is chartered by various companies (including Hebridean Island Cruises, Voyages of Discovery and Noble Caledonia) to sail the key European rivers (Danube, Rhine and Main) and thus operates in a slightly different way for each company as far as pricing, excursions, meals etc. are concerned. Generally-speaking, however, the experience of the Royal Crown is intended to compare with that of a private yacht, with passengers luxuriating in their sumptuous surroundings and enjoying cosseting service and genteel cruising. In reality, the cabins are rather small, particularly when compared with modern river cruise ships; the ship occasionally shows her age by running out of hot water at peak times and providing erratic air-conditioning; and the service, while friendly, is not always as efficient or slick as it could be. However, the overall experience is idyllic, and the classic beauty and comfort of the Royal Crown are undeniable. Passengers aboard the Royal Crown are well-travelled, experienced cruisers and mature (60 years plus), particularly when the ship is chartered by Hebridean Island Cruises, which prides itself on caring for more mature travellers, and solo travellers. The nationality of passengers depends on which cruise line is chartering it, with Britons representing the overwhelming majority on Hebridean Island Cruises, Voyages of Discovery and Noble Caledonia voyages. During these cruises, all ship announcements are made in English. While there is no strict dress code for non-Gala dinner evenings, guests typically adhere to smart casual dress throughout the day and dress up for dinner (more cocktail smart than country club). Typically, there are two formal dinners which, certainly in the case of Hebridean Island Cruises voyages, are full-on sequins and glamour, with men sporting black tie and kilts where possible. 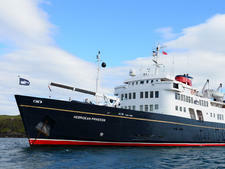 When operated by Hebridean Island Cruises, gratuities are included. The onboard currency is the euro.